I have mentioned before that life in my “milieu” is very high-paced pretty much all the time. There are too many commitments and not enough time. I am sure I am not original, and most of you are in the same boat. I let go of some things in order to survive simplify our daily life (the dust bunny under the bookshelf can wait a few days). Other things, like healthy eating, will always remain a priority and are not negotiable. That said, I don’t have a luxury of spending hours in the kitchen (I would, if I could! ), so eating healthy needs to also be time efficient. fast healthy home-made dinners, that require 20 minutes or less hands-on time. With a few fresh ingredients in my fridge/freezer, and some pantry staples, I can have dinner on the table in less time then it takes to get seated at a table at a restaurant. Yes, there is always an option of store-bought frozen dinners, but they don’t fit in with my goal of feeding my family as healthy as possible. Especially when I know a delicious and nutritious meal is just 20 minutes away! The recipe below is a perfect example: it came together in a flash when we were having an especially busy night. I hadn’t prepared dinner in advance because I knew I had shrimp in the freezer and some veggies in the fridge. I was in the mood for a “creamy”version. I added some chicken breast, as you can see in the picture, because I had a lonely breast in the freezer. But you can easily leave it out if you want. 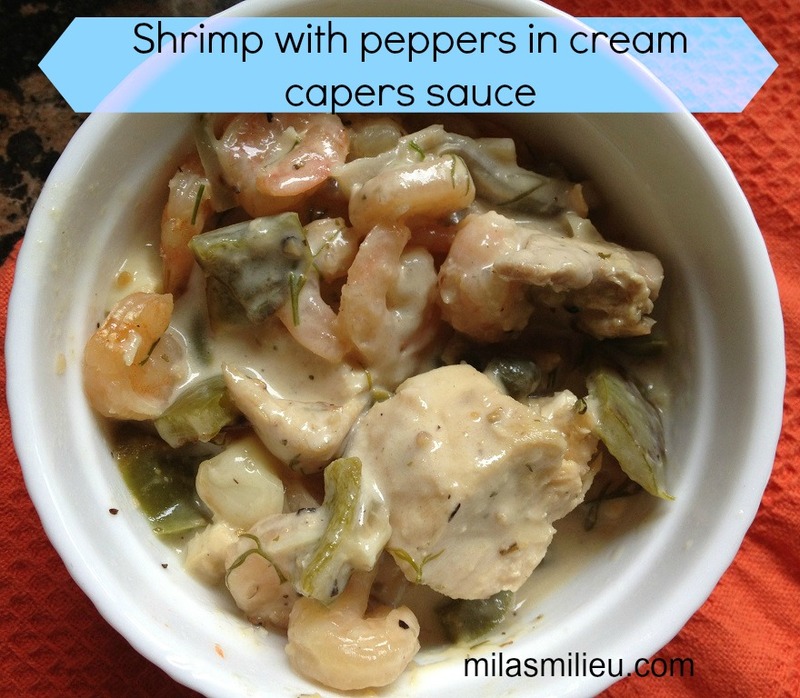 Quick dinners from scratch: Shrimp with pepper in cream capers sauce. 1 tsp each dried oregano and dill (if you have fresh dill– even better!). Can use parsley in place of dill, but I prefer dill. 1. If using chicken breast, saute it in 1 Tbsp canola oil on medium-high heat for 3-4 minutes until no longer pink. Skip this step for a vegetarian option. 2. Add another tablespoon of oil, bell pepper and red onion, and saute on medium heat for about 3 min, till soft. Add garlic, cook additional minute, stirring. 3. Add flour, stir all together and cook for a minute. 4. Add wine and chicken broth. Can use all broth and no wine, but wine gives it a characteristic flavor (alcohol evaporates). 5. Add the herbs, capers and salt and pepper to taste. Add cream and stir everything to combine and bring to a simmer. 6. Add a pound of shrimp, stir and simmer a couple more minutes till shrimp are cooked. I served this over spaghetti squash (just followed the directions on the the sticker label on the squash). We loved this combo, kids were even disappointed we ran out of the squash too fast. – Keep an open mind and be creative with the ingredients you have on hand. Almost anything can work as a dinner (provided your stock is made of mostly healthy ingredients). I will be posting more recipes in this category on my blog. – Keep stock of fresh staples in the fridge/freezer that cook fast: shrimp peeled and deveined), eggs, veggies (frozen are usually a fine alternative to fresh), dairy. – Keep stock of quick-cooking pantry items: couscous, rice, canned salmon/tuna, beans, spaghetti sauce (not just for spaghetti! ), etc. And one final note: As much as I love to cook from scratch, and can usually fix something healthy fast, pre-packaged dinners have their place on our table time to time. I stand by a “once in a while” rule: occasional store-bought frozen dinner won’t harm anybody. It is about keeping the balance between my priorities and my sanity. I would love to add your ideas to the list. Please share in the comments section! If you liked this, spread the word! Share it with your friends using the buttons under the post! I like your philosophy and we try to do the same thing. We would much prefer to eat at home than to run into restaurants all the time. We do eat out just not 3 times a week. Thanks for stopping by and commenting, Stacey! I am with you: nothing wrong with eating out, but not as a solution for a “busy night– no dinner” situation. For some reason, if we go out on a busy night, the dinner ends up really stressful. My guess is that we are not the only ones needing to be fed:) It is a completely different experience when we go out to eat to a really special place, on a special occasion, and appreciate the food and the company. Otherwise, there is always a quick simple meal at home. Your house looks beautiful and inviting! I am not a fan of cooking so fast and easy is my style! Looking forward to more of you 20 minute or less recipes! I love that you go with a 20 minute time frame. I’m with you. If you keep enough of your staples on hand you really can whip up a healthy dinner in no time. This recipe looks great, I will be trying it! Thanks, Morgan! I hope you will like it! It is also easy to “customize”– if kids don’t like shrimp, it can be left out. Super easy and Super quick dinner! I made it for dinner and everyone in my family absolutely loves it! I will add it to my week meal recipes. Thank you Mila! I cannot wait for more quick and easy recipes! Ollie, I am so glad your family liked it! I will be posting a recipe for a kale and tomato frittata later this week!